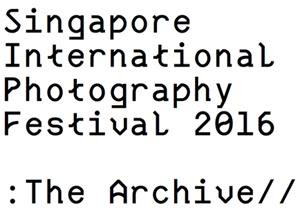 The Singapore International Photography Festival (SIPF) returns with its fifth edition to celebrate the art of photography, embracing the theme, The Archive. The characteristics which defined the festival from its first edition are firmly rooted, and continue to be evident in this showing: championing creativity and ideas, cultivating the appreciation of contemporary photography, inspiring new photographers to hone their art and advocating that photography can be enjoyed by all. The SIPF serves as a platform that brings together passionate, like-minded individuals from around the world. It is a showcase for exceptional works and advocates intercultural dialogues, programmes and workshops for the exchange of diverse and creative concepts in the art of photography. Since its inception, the SIPF has garnered success but continues to push forward. While persevering to provide a pivotal stepping stone for lesser known photographers and help spur them on to the international arena, the SIPF also does not lose sight of its other objective – to stimulate public interest in photography. Thus, a festival showcase across six MRT stations, underscoring their desire in making this year’s festival destination-friendly, accessible and all-encompassing, beyond walls and into public spaces. The MRT photography festival trail is an ‘open concept’ that allows everyone to easily hop on and off the MRT to experience the art of photography. Passers-by, commuters, visitors and enthusiasts will be able to appreciate the art form and ponder on the stories that each photograph communicates; perhaps sparking an interest in photography in a young one, evoking memories for someone else or for another, simply delighting in captivating images. Straying a little off the MRT trail are more showcases at Alliance Française de Singapour, DECK, Institute of Contemporary Arts Singapore at LASALLE College of the Arts, National Library Building, The Arts House Singapore and Gillman Barracks. “The Archive explores the nature, and roles of photography in society. The acute shift in the boundary of photography, alongside with technology advancement, and the surging social platform produced new frontiers and discovery, and as well as indistinctive status of photography in both institution and personal lives”, said Gwen Lee, Artistic Director and Co-Founder of SIPF and DECK. Still images convey unspoken words and evoke a myriad of emotions through the eyes of the photographer. They could be physical documents, images that are saved in one’s computer or mobile phone, or may simply remain in the recesses of one’s mind. All of which epitomise forms of The Archive. Running from 19 August to 13 November 2016, more than 1,200 photographic works by 58 artists from 19 countries will be displayed in six exhibitions. The festival also features educational programmes for the public, industry professionals and students. 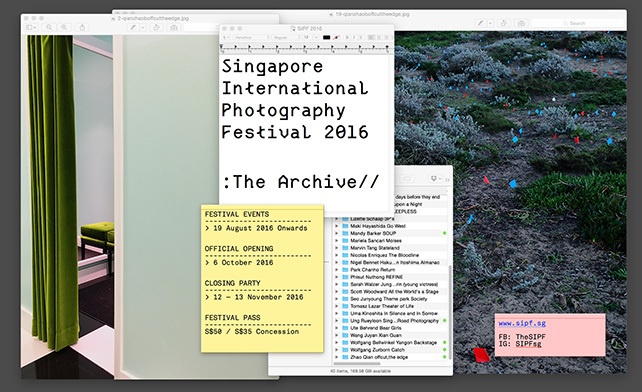 5th Singapore International Photography Festival 2016: The Archive from DECK Singapore on Vimeo. Admission: Admission is free for all festival exhibitions (no pass required), except for Daido Moriyama: Prints & Books from 1960s – 1980s exhibition at DECK. Fees apply for all professional and public workshops. Festival passes can be purchased at S$50 from http://deck.bigcartel.com/product/5th-sipf-festivalpass, or from the festival office, DECK.